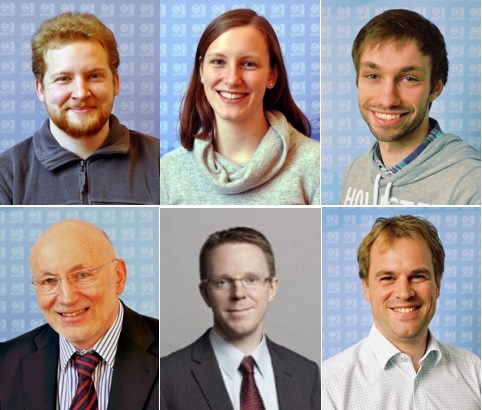 From Left to Right: (top row) Jan Mahnke, Ilka Kruse, Andreas Hüper, (bottom row) Wolfgang Ertmer, Jan Arlt, Carsten Klempt. During the last decades, the quantum regime could be accessed through very different systems, including trapped ions, micromechanical oscillators, superconducting circuits and dilute ultracold gases. Mostly, these systems show the desired quantum-mechanical features at ultra-low temperatures only. The lowest temperatures  to date are reached in dilute atomic gases by a combination of laser cooling and evaporative cooling. This approach has two disadvantages: It relies on the internal structure of the atoms due to the laser cooling and it can only cool discrete samples instead of continuous beams due to the evaporative cooling. However, many applications would greatly benefit from a continuous source of cold atoms, for example sympathetic cooling  of molecules. Here, the molecules are brought into contact with a bath of cold atoms to redistribute the thermal energy through collisions. Ideally, such a cold bath is realized in absence of disturbing laser light as the rich internal structure of the molecules results in a broad absorption spectrum and any photon can potentially harm the cooling process. Another application of a continuous beam of cold atoms is continuous matter interferometry. 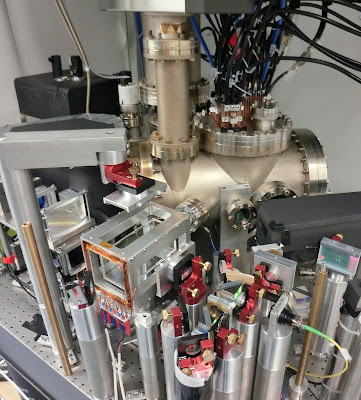 Atom interferometry is already in use for the precise measurement of many observables, including time , gravity  and rotation . These measurements could greatly benefit from a continuous observation instead of the sequential interrogation of discrete samples. Even though continuous sources are highly desired, no continuous sources without the application of laser light have been demonstrated in the microkelvin regime yet. One possible realization of an ultracold continuous sample was proposed theoretically , where a conservative and static trap is loaded by an atomic beam. In this scheme, pre-cooled atoms are guided towards the entrance barrier of an elongated trap with a finite trap depth (see figure 1). 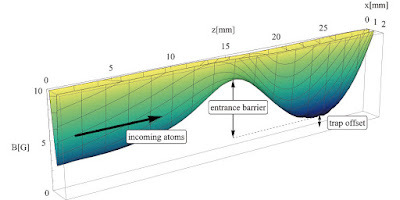 If the atoms pass the entrance barrier, they follow the elongated potential until they are reflected by the end of the trap. The strong confinement in the radial direction ensures that most atoms collide with another atom before they reach the entrance barrier again. These collisions allow for a redistribution of the kinetic energy. Consequently, some atoms acquire a kinetic energy larger than the trap depth and escape the trap. Other atoms lose energy and stay trapped. If the trap parameters are chosen well, an equilibrium condition with a surprisingly large phase-space density may be reached. Figure 1: 3D plot of the static trapping potential in the x–z-plane through the point of the trap minimum. In our recent publication , we demonstrate the first experimental implementation of such a continuous loading of a conservative trap. Our realization is based on a mesoscopic atom chip (see figure 2 and Ref. ), a planar structure of millimeter-sized wires. The mesoscopic chip generates the magnetic fields for a three-dimensional magneto-optical trap, a magnetic waveguide and the static trapping potential described above. The three-dimensional magneto-optical trap is periodically loaded with an ensemble of atoms. 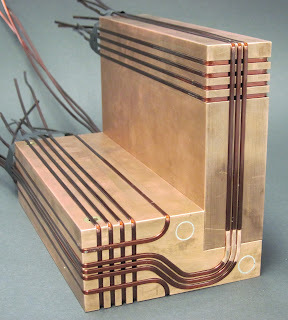 These ensembles are launched into the magnetic waveguide, where they overlap and produce a continuous atom beam with varying intensity. This beam traverses an aperture which optically isolates the loading region from the static trapping region. In this trapping region, the atom beam is directed onto the elongated magnetic trap, where the atoms accumulate. Figure 2: Photograph of the mesoscopic atom chip with millimeter-scale wires. The magneto-optical trap is in the lower left area and the static trap is generated in the top right area. The bend wires create a guide connecting the two regions. With this loading scheme, we create and maintain an atomic reservoir with a total number of 3.8 × 107 trapped atoms at a temperature of 102 µK, corresponding to a peak phase-space density of 9 × 10-8 h-3. This is the first continuously loaded cloud in the microkelvin regime without the application of laser light. Such a continuously replenished ensemble of ultracold atoms presents a new tool for metrological tasks and for the sympathetic cooling of other atomic species, molecules or nanoscopic solid state systems. The scheme is also very versatile in creating cold samples of atoms and molecules directly, as it does not rely on any internal level structure. Figure 3 Photograph of the experimental setup. The atom chip is visible outside of the vacuum chamber at the top. In the front is the glass cell and the optics for the two-dimensional magneto-optical trap, which is used to load the three dimensional magneto-optical trap on the chip. A. E. Leanhardt, T. A. Pasquini, M. Saba, A. Schirotzek, Y. Shin, D. Kielpinski, D. E. Pritchard, W. Ketterle. “Cooling Bose-Einstein condensates below 500 picokelvin”, Science, 301, 1513 (2003). Abstract. Wade G. Rellergert, Scott T. Sullivan, Svetlana Kotochigova, Alexander Petrov, Kuang Chen, Steven J. Schowalter, Eric R. Hudson, “Measurement of a large chemical reaction rate between ultracold closed-shell 40Ca atoms and open-shell 174Yb+ ions held in a hybrid atom-ion trap”, Physical Review Letters, 107, 243201 (2011). Abstract. R. Wynands and S. Weyers. “Atomic fountain clocks”, Metrologia, 42 (3), S64 (2005). Abstract. A. Louchet-Chauvet, S. Merlet, Q. Bodart, A. Landragin, F. Pereira Dos Santos, H. Baumann, G. D'Agostino, C. Origlia, “Comparison of 3 absolute gravimeters based on different methods for the e-MASS project”, Instrumentation and Measurement, IEEE Transactions on, 60(7), 2527-2532 (2011). Abstract. J. K. Stockton, K. Takase, and M. A. Kasevich. “Absolute geodetic rotation measurement using atom interferometry”, Physical Review Letters, 107, 133001 (2011). Abstract. C. F. Roos, P. Cren, D. Guéry-Odelin, and J. Dalibard. “Continuous loading of a non-dissipative atom trap”, Europhysics Letters, 61, 187 (2003). Abstract. J. Mahnke, I. Kruse, A. Hüper, S. Jöllenbeck, W. Ertmer, J. Arlt, C. Klempt. “A continuously pumped reservoir of ultracold atoms”, Journal of Physics B: Atomic Molecular and Optical Physics, 48, 165301 (2015). Abstract. S. Jöllenbeck, J. Mahnke, R. Randoll, W. Ertmer, J. Arlt, C. Klempt. “Hexapole-compensated magneto-optical trap on a mesoscopic atom chip”, Physical Review A, 83, 043406 (2011). Abstract.